This Saturday, Matthew Mullins hosts an artist talk for his solo exhibition The Sun In Our Bones. When Mullins began working on the monumental show last year, he was shooting for the stars. “I thought about this spectrum of very earthy and grounded to the cosmos,” says Mullins. “How do you encompass that staggering span, and pull someone all the way through it?” The exhibition is on view through November 17, 2018. Scroll down to see selections from the exhibition, and click here to browse all of the artwork online. In August, Dr. Estevan Rael-Gálvez convened beneath the Flying Blue Buffalo for a special lecture titled Entre Cíbolos Criados: Creativity, Consciousness and Community. In his moving speech, Dr. Rael-Gálvez discusses the three concepts that have long defined his work and the history of Indigenous slavery. It is a tremendous honor to be able to participate in this opening by the amazing artist, Armond Lara – whose memorial is… breath-taking, but it gives breath as well. This thoughtful remembering is a project — that through creativity raises consciousness — and in the end, is inspired by the promise of strengthening community. Here in this sovereign landscape, Pueblo elders have said that, “wherever we go, we leave our breath behind us” — an invocation recognizing those who came before us and how their life force remains with us long after they have gone. In recognizing this life force, we not only illuminate all of the ancestors who lived in this place, but point especially to the life of those living now in the present, as well as to those generations that will follow, inheriting what we leave behind in the future. In time, drawn to the subject of enslaved Indians as a young scholar, I would immerse myself as a historian in countless archives, reading between the lines of documents, tracing my finger across maps and looking closer at photographs, all complemented by my work as an anthropologist, engaged in many hundreds of conversations set with bread at kitchen tables, revealed upon a walk through alfalfa fields, and shared across miles by telephone and electronic correspondence. Taking those experiences, connecting them and eventually centering them, the story grew like a forest, one that eventually became a manuscript defended by me to hold a doctoral credential. However, believing that scholarship is most valuable when grounded and applied in the world, I left academia, and yet through my role as a public historian and anthropologist, indeed, because of it, the story only deepened further, to this day. So when I talk about consciousness now, I am not only referring to the work I have done as a scholar and public historian for over two decades, but a commitment to raising consciousness on the ground, locally, in the minds of people in our region and nation, particularly in the minds of those who have not yet recognized that this story, however painful, is also one of complex beauty. This is no easy task. The eyes of all of the descendants of those indigenous ancestors continue to awaken the possibility of remembering with each new birth of a New Mexican. Telling this Story—in whatever form that telling comes— is about how individual and collective lives are remembered, how a community takes the memories, stories and traditions of what has been passed down from one generation to the next, and how it reimagines itself, now in the present and into the future. We are the herd of buffalo that rises. Dr. Rael-Gálvez holds a B.A. from the University of California at Berkeley and an M.A. and Ph.D. from the University of Michigan at Ann Arbor, where he completed an award-winning dissertation, “Identifying Captivity and Capturing Identity: Narratives of American Indian Slavery.” Formerly the State Historian of New Mexico, Executive Director of the National Hispanic Cultural Center, and Senior Vice President at the National Trust for Historic Preservation, Dr. Rael-Gálvez currently is a writer and the founding principal of Creative Strategies 360°. The gallery will ask for a $5-$25 donation in support of the artists at the door. Caitlin Brothers is going places—specifically, all across the Southeastern United States. “The new tour passes through Oklahoma, Arkansas, Missouri, Kentucky, Louisiana, and Texas,” says the Santa Fe musician, who performs under the moniker ppoacher ppoacher. “I’m trying to split it between familiar territory and places I’ve never explored.” That’s a good way to describe her musical repertoire for an upcoming Matron Records tour launch event at form & concept. Brothers and her new bandmate Nathan Smerage will perform songs from the band’s 2017 debut album, along with some new material they’ve written together. She’ll also sing traditional Balkan music with Santa Fe’s Sevda Choir, which welcomed her into its ranks a few months ago. New Mexico School for the Arts is in the midst of renovating and repurposing their new Railyard location, and they’re wasting no time injecting fresh creative energy into the district. The arts high school presents a special performance series at form & concept, hosted by faculty members and showcasing student musicians, fiction writers and poets. This month’s event includes readings by three young writers, and a music program of small-set jazz duos curated by Jazz Studies teacher Orlando Madrid. Make sure to mark your calendar for NMSA performances on the first Thursday of each month. Caitlin Brothers is going places—specifically, all across the Southeastern United States. “The new tour passes through Oklahoma, Arkansas, Missouri, Kentucky, Louisiana, and Texas,” says the Santa Fe musician, who performs under the moniker ppoacher ppoacher. “I’m trying to split it between familiar territory and places I’ve never explored.” That’s a good way to describe her musical repertoire for an upcoming tour launch event at form & concept. Brothers and her new bandmate Nathan Smerage will perform songs from the band’s 2017 debut album, along with some new material they’ve written together. She’ll also sing traditional Balkan music with Santa Fe’s Sevda Choir, which welcomed her into its ranks a few months ago. ppoacher ppoacher’s Fearsome Friend Tour Launch is on Thursday, September 6 at 7:30 pm. The gallery will ask for a $5-$25 donation in support of the artists at the door. Monday through Friday, Tashi Gyalkhar is a staff manager in the state of New Mexico’s Human Services Department. The fast-talking thirty-six-year-old spends Saturday mornings as an assistant teacher at the Tibetan Association of Santa Fe, helping children learn the Tibetan alphabet. Gyalkhar immigrated to Santa Fe from Dharamshala, India, when she was sixteen years old, as part of a resettlement project of 1,000 Tibetans that began in the early 1990s. Her mother came first, among the first couple of dozen Tibetans to move to Santa Fe, and Gyalkhar followed with her father and older brother a few years later. Read more from Levin here, and we’ll see you tonight at Murals of Tibet with Thomas Laird! This event is free and open to the public, and light refreshments will be served. Thomas Laird, the photographer behind the new TASCHEN book Murals of Tibet, will appear at form & concept this Friday at 5 pm for a special event. He’ll talk about his journey of over ten years to create this stunning archive of Tibetan Buddhist art, and offer visitors an intimate look at the SUMO-sized Collector’s Edition of the book. Murals of Tibet has been on display in the gallery’s atrium since early July, and Laird’s appearance marks its final day here. For centuries, Tibet has been seen as an island in the sky. A remote land, close to the lights, beyond the mountains. A mysterious land, where monks practiced rituals and yoga that led to wisdom and power. What if, even in our age of increased accessibility, a great treasure still remained—hidden all of these centuries? Visions from another world. Visions created to inspire, as Tibetans say, liberation upon seeing. Over the course of five expeditions, and using multi-image capture and render technology, Thomas Laird amassed the first catalog of life-size images of more than 200 Buddhist mural masterpieces—including the oldest and most important painted during the past 1,000 years. The murals can now be appreciated much better than on site. They have never been explored to the extent as they have been now, because the walls are 9 meters high, the lighting is terrible. You never were able to look up and study the faces. You cannot get the picture with one photograph. It is a sum of pictures taken digitally and stitched together. I spend the day shooting hundreds of images. That’s a lovely day in Tibet, in a dark room. […] You see the Buddha when you’re done that day, but you also have a headache. Then you bring that home, and you sit down in front of a computer, and your wife puts up with you for a month or six weeks. Then you say to her, ‘It’s very nice, but it’s not proper… so I need to go back to Tibet to recapture this. Come meet Laird and learn more about Murals of Tibet on Saturday. This event is free and open to the public, but seating is limited so make sure to arrive early. For more than a decade, American photographer Thomas Laird traversed snowy mountains, deep valleys, and desolate deserts to capture images of Tibet’s spectacular Buddhist murals. He worked with internationally renowned art book publisher TASCHEN to make Murals of Tibet, a 498-page volume that is the world’s first archive of these sacred artworks. form & concept hosts Laird at a special event where he’ll share stories of the book’s creation, and offer visitors an up-close look at the Collector’s Edition of the book. 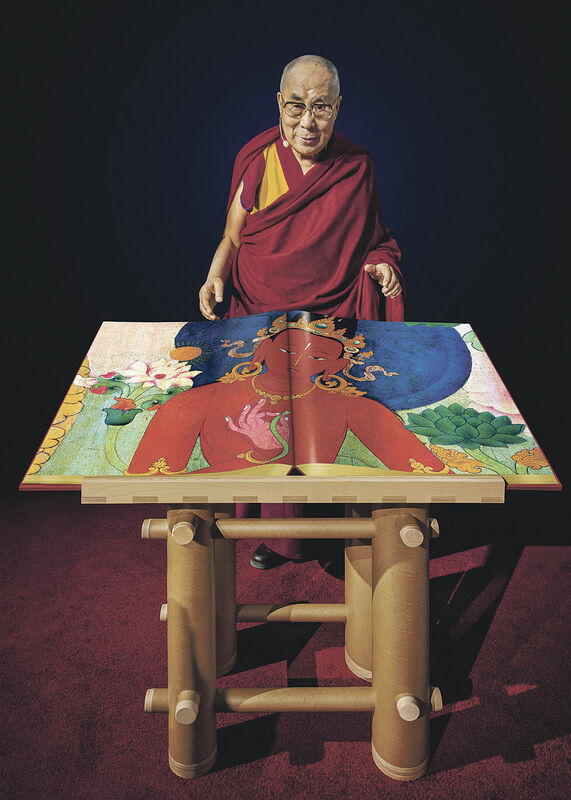 The hardcover volume is signed by his Holiness the Dalai Lama and features Laird’s photographs in life-size resolution. The event is part of a national tour of the book by TASCHEN. It takes place at form & concept on Friday, August 31 from 5 to 7 pm. Murals of Tibet is on view at form & concept from July 12 through August 31, as part of a national tour. “I spend the day shooting hundreds of images. That’s a lovely day in Tibet, in a dark room. […] You see the Buddha when you’re done that day, but you also have a headache,” Laird told Richard Gere at a TASCHEN event in New York earlier this year. “Then you bring that home, and you sit down in front of a computer, and your wife puts up with you for a month or six weeks. Then you say to her, ‘It’s very nice, but it’s not proper… so I need to go back to Tibet to recapture this.” Using this innovative multi-image digital photography process, Laird captured murals as wide as 10 meters in exquisite detail. The publication of this unprecedented record of Tibetan art is so momentous that it caught the attention of His Holiness the 14th Dalai Lama, who signed all 998 copies of the Collector’s Edition. As the Dalai Lama has explained, these murals are not just objects of beauty, but serve as points of reference and guidance for practitioners of Buddhism, yoga, and meditation, as well as for anyone seeking to incorporate mindfulness into their daily life. Binding contemporary photographic technology with ancient traditions, this book is at once a majestic art piece, a major milestone in the appreciation of Buddhism, a precious monument to Tibetan culture, and a vital source for the contemplative arts and sciences. The SUMO-sized Collector’s Edition comes with a bookstand designed by Pritzker Prize-winning architect and humanitarian pioneer Shigeru Ban. As the murals are often massive in scale, Murals of Tibet measures 19.7 x 27.6 in. In a 528-page scholarly companion book, Buddhist writer and academic Robert Thurman takes us through this transcendent journey with detailed text on the murals’ spiritual significance while captions from experts Heather Stoddard and Jakob Winkler shed light on the storylines and artistic context of each image. This weekend, when Santa Fe artist Armond Lara sends 77 winged buffalo sculptures into the stratosphere of form & concept’s atrium, he’ll fulfill a long-held dream. The Flying Blue Buffalo installation tells the centuries-long story of enslaved Native American children—including Lara’s grandmother. The Pueblo people called these abducted youths “Lost Bluebirds.” Lara combined this symbol with the buffalo to create the Flying Blue Buffalo, a new icon of Indigenous resilience. Listen to Armond Lara’s interview with Spencer Beckwith on KUNM, and learn more at the links below. Image: Armond Lara, Flying Blue Buffalo installation. Soul of Nations, a Washington, D.C. and Arizona-based nonprofit that works to uplift Indigenous communities throughout the Americas, presents this juried exhibition of Native teen artists from Southwest reservations. Inspired by the theme “Honor the Earth,” the participants offer fresh perspectives on Indigenous identity, contemporary culture and the state of the environment. The 15 featured artists offer boundary-pushing aesthetic statements from a new generation of Indigenous creatives. Image: Kiara Tom, The Y’ell Night Chants, acrylic on canvas, 24 x 18 in. Suspended from the ceiling is a herd of blue buffalo, seventy-five of them, flying on wings. The buffalo tell the story of thousands of Native American children who, from the 17th Century through the 19th, were abducted from their families and enslaved on ranches and in homes across the Southwest. The Flying Blue Buffalo installation is the creation of veteran Santa Fe artist Armond Lara, and it’s on view starting August 17 at the Santa Fe gallery, form & concept. I decided that all I would see was a cloud of blue. I thought it would be a beautiful presentation. That’s the whole philosophy for Navajo people. Walk In Beauty. It has to be in a beautiful way. It doesn’t have to be ugly, even though it is ugly. We can take the pride and the endurance of still being here. Like the buffalo. Meanwhile, we’re deep in the installation process for Armond’s show. You can see the grid system we’re using in the photo above, which will support all of the sculptures in the piece. Come see it on opening weekend, August 16-18! RSVP for the opening on Facebook. The son of a borreguero (sheep herder) in northern Taos County, Estevan Rael-Gálvez says he constantly lost his flock. Life on the farm wasn’t for him. So with his mother’s encouragement, he walked away from his family’s generations-old trade of sheep and farming in Costilla and Questa to answer his calling—academia, and ultimately a much larger world where culture, art and politics converge. Dr. Rael-Gálvez holds a B.A. from the University of California at Berkeley and an M.A. and Ph.D. from the University of Michigan at Ann Arbor, where he completed an award-winning dissertation, “Identifying Captivity and Capturing Identity: Narratives of American Indian Slavery.” He is currently working on the manuscript The Silence of Slavery.